Come cheer our Branch Finalists in their quest for the chance to represent Chicago at the National Shakespeare Competition at Lincoln Center in NYC! Finalists L-R Morgan Taylor (York High School), Aidra Crawley (Wheeling High School), Kateri Halbleib (ChiArts), Ben Johnson (Huntley High School), Alexander Kuznetsov (Hinsdale Central), Ann Urbanski (Brookfield Academy) and Claire David (New Trier). Attention high school students! Come for an exciting, immersive three-hour workshop, and learn how to make Shakespeare come alive in your performances. Facilitated by actors from The Shakespeare Project of Chicago, you will learn tools and techniques for unlocking emotion and meaning in Shakespeare's texts. A fantastic afternoon for polo and & Pimm's Cup was spent at the Oak Brook Polo Fields. 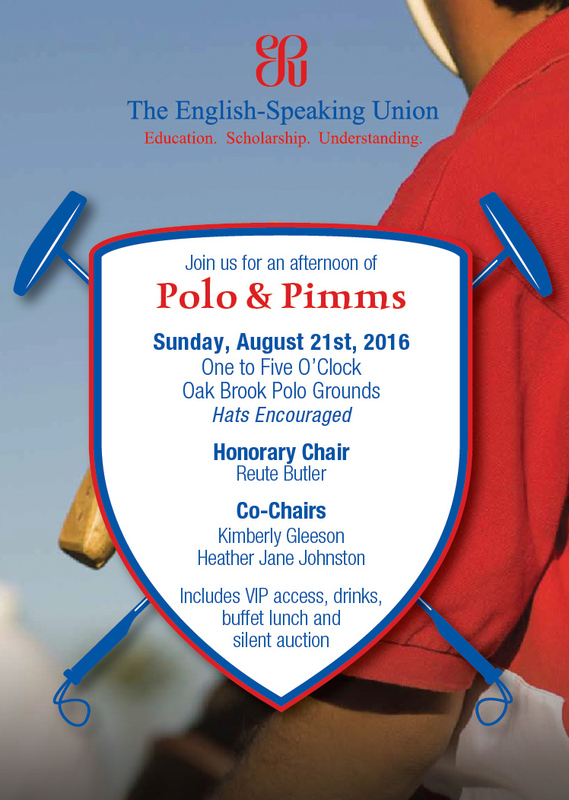 Co-Chaired by Heather Jane Johnston and Kimberly Gleeson and Honoring, Reute Butler.